This walk: 2012-11-14. Brimpts Plantation car park, logs, sawing depot ruins, Bellever Forest, Soussons Wood, Warren House Inn, Babeny, Sharp Tor, Bellever Tor, Loghtor Man, Laughter Tor, Pixie snot, Brimpts North Mine, Adit Shaft, Engine Shaft, stamping mill, wheel pit, dressing floors, dung bonnet, dry leat, slotted gate post, Huccaby Tor, Dartmoor pony. Link to Google Satellite view of the area. 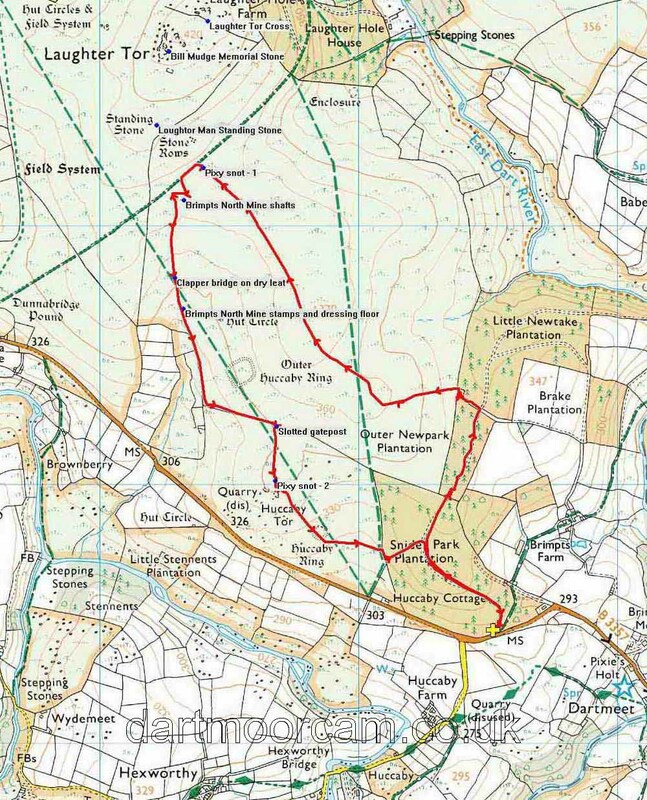 - the car park was just left of the B3357 label, with Huccaby Ring in the centre of the map and the mine waterwheel pit a short distance north-east of the fields to the west of Huccaby Ring. Sign at the Brimpts Plantation car park. Brimpts Farm dates back to 1307 and was one of Dartmoor's ancient tenements. The original farm longhouse was further down the slope and closer to the River Dart. Click the photograph to see a larger version. A few logs, or tree trunks. As previous photograph, trying to capture the trees reflected in the water. Part of Bellever Forest (left) and Sousson's Down (right) with Riddon Ridge in the centre. A view to Hamel Down (the high ridge) with the corner of Little Newtake Plantation (Brimpts). Zoomed view to the Warren House Inn. A view of the farm fields at Babeny (another ancient tenement). Zoomed view to Sharp Tor, Sharp Tor, SX 686 729, elevation 380 metres (1246 feet), showing the road going uphill from Dartmeet to Ponsworthy and towards Widecombe-in-the-Moor. Laughter Tor, 653 757, elevation 420 metres (1377 feet). What we know as Pixie Snot aka Pixie Dust found on the moor sometimes, possibly produced by a female frog whose egg-laying process has gone awry, in November? An overview of four samples, at SX 65290 74798. North Mine information board. Click the photograph to see a larger version. Dung Bonnet (Bolbitius vitellinus), a coprophilous fungus that breaks down dung. These are larger and more delicate than Dung Roundheads (Stropharia semiglobulata). Site of the dressing floors where the crushed i.e. "stamped" ore, now powdered to the consistency of sand, was sorted into heavy tin-rich material and lighter waste, by means of a water separation method (in buddles, see under Concentration). The track of the leat tailrace from the water wheel. Dressing floor information board. Click the photograph to see a larger version. A gate that utilises an old slotted gatepost. A view into the trees. This walk was reached by driving east from Two Bridges on the B3357 to a gateway on the left shortly after the right-hand turn down to Hexworthy, by the large green sign for the Forest Inn, parking at the yellow cross symbol on the map above.